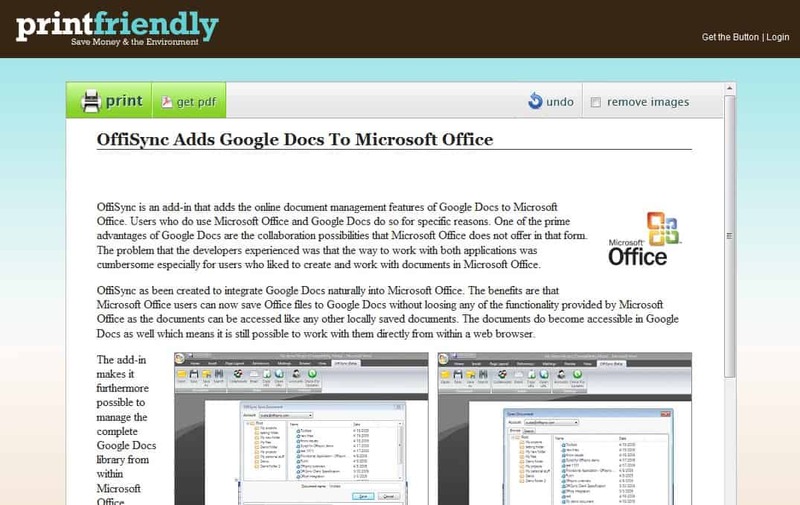 Print Friendly is a free online service that you may use to turn any web page into a copy that is optimized for printing. We have covered services and applications before that allow users to remove elements from websites before adding them as a new print job for printing. Some examples are Print What You Like, HP Smart Web Printing or Best Way to Print Websites which covers two extensions for the Firefox web browser. All applications have in common that they can save you paper, ink and time thanks to options to remove page elements automatically or manually before printing. Print Friendly is a web based service that is available as a web service, as a bookmarklet and for website owners as a script to put on their websites directly. Print Friendly removes certain elements like advertisement or menus by default from the website. By doing this it reduces the printer ink needed to print the website, and often also paper required for it. More important than that is probably the option to remove additional elements before sending the rest of the document to the printer. The customize option makes it possible to remove additional unwanted elements such as tags or images from the document before sending it to the printer. Print Friendly offers an option to automatically remove all images from the document to make things easier if a document contains many of them. It also features an undo option in case that you want to go back to a previous state. You can move the mouse cursor on the document directly to delete any element that you hover the cursor over. This includes among other things images, text paragraphs, headlines, and more or less any other element that is still available after having been processed by Print Friendly in first place (some elements are automatically removed from documents). The optimized document can then be printed or turned into a pdf on the Print Friendly website. It is also possible to email the document to recipients. The bookmarklet makes it easier to use the service while surfing the Internet as it will automatically load the active website in the Print Friendly website. Print Friendly might come handy in situations where other tools or extensions that can remove elements from websites before printing are not available. If you print content displayed in the web browser regularly, you may find Print Friendly useful for that as it will save you ink and paper in the long run. I'd suggest you use the bookmarklet, as it speeds things up even further. Our goal was to bring a little style and ease of use to online printing. Your content looks great with PrintFriendly. Have you thought about adding the button?